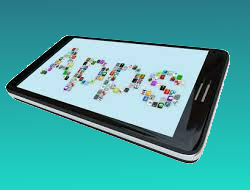 Apps – small programs or “application” that run on mobile devices. Some people have made millions with them. Certainly as a tool for business they are supreme – always in your customers’ pocket. Can be updated automatically without the user having to do anything. Always display your current prices, special offers etc. Typically apps cost many thousands of dollars to develop, but try us – you will be VERY pleasantly surprised! Delay not –call us now or use our contact form at right.